I finished this puzzle, but for weeks I didn’t think I would. It sat on my dining room table with just its outline and a few areas filled in. Several times, I was ready to break it apart, stuff it back in its box, and forget about it. I guess I’m just no good at jigsaw puzzles, I thought. And it is only a 300 piece one! That’s a fixed mindset. I was faced with a hard task. I judged (myself in this case) as not being talented or smart enough to tackle the task, and immediately leapt to quitting. Don’t try and you won’t fail! Wrong. Not trying is failing. Even for little things like putting together a puzzle. 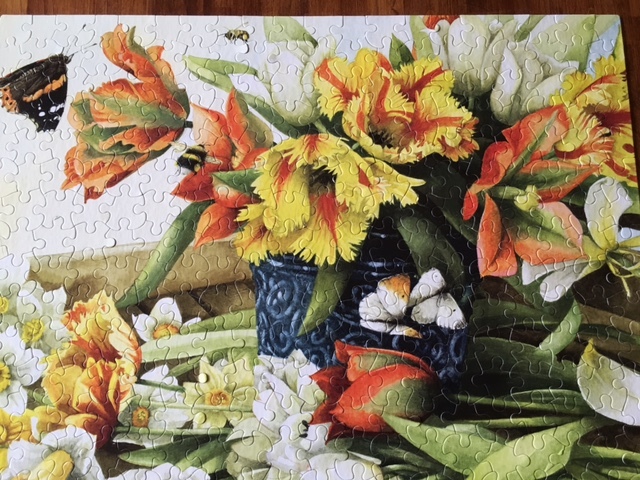 I was overwhelmed by my inability to see where the pieces would fit to make the picture since they were all such uniformly washed out shades of white, yellow, and soft green. The image had few “landmark” images to go by so my usually approach to solving the jigsaw was not working. Instead, I had to find a new approach. Quelling my frustration, I decided to sort the pieces by color, shade, and then by shape. I worked in one, limited area, inching my way along. Using reductionism, limiting the options, I found it easier to select the right pieces until the picture started to appear. When a piece that was the exact color still did not fit, I turned it in all possible directions and more often than not, it worked! The more I succeeded the more confident I became in picking out the right piece.